Connect directly with a glass specialist when sourcing custom glass and quartz products on customglassparts.com. Wilmad-LabGlass’ new custom glass website is designed to get your project moving with ease. Customglassparts.com is a sourcing portal designed to showcase the company’s capabilities and core custom categories, and enables you to start the quoting process and connect to a glass specialist who can help plan and map out the details of your project. Sourcing custom glass or quartz parts can be a daunting task. Finding a manufacturer that aligns with your needs and has the capabilities to properly execute your job can take many hours of emails, phone calls and on-line research. Wilmad-LabGlass’ new web site customglassparts.com is a sourcing portal designed to showcase the company’s capabilities and core custom categories, and enables you to start the quoting process and connect to a glass specialist who can help plan and map out the details of your project. Among those capabilities are precision grinding, quartz work, glass coatings, freehand glassblowing, and much more. Customglassparts.com also provides a gallery of core OEM products that Wilmad-LabGlass currently produces for leading instrumentation and equipment manufacturers and includes flow cells for spectrophotometers and flow cytometers, dissolution vessels, capacitors, flowmeter tubes and precision shrinking of PB tubing. “We all want to be able to obtain the information we need in one location and that is no different for the customer who is trying to source a new piece of custom glass. This website was created with that one thing in mind to give the customer a sourcing portal that answers all of their questions” stated Aaron Romyns, Wilmad-LabGlass Brand Manager, who led development of the new site. Wilmad-LabGlass OEM produces custom glassware in their ISO 9001:2008 registered facility for customers worldwide. For more information on the process visit http://www.customglassparts.com. Wilmad-LabGlass is a leading manufacturer of specialty laboratory and analytical chemistry glassware, NMR & EPR consumables & precision bore glass tubing produced under ISO 9001:2008 quality standards. Rotary Evaporators and other small laboratory equipment are also offered. In addition to our 8000+ standard products our highly skilled glass team offers design and fabrication of custom borosilicate glass & quartz products for your applications, OEM manufacturing, as well as glass repair services. Wilmad-LabGlass is located in Vineland, NJ with regional locations TN and IL. http://www.wilmad-labglass.com. 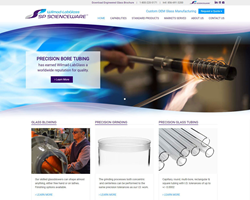 Superior service, support and technical know-how to give you confidence, Wilmad-LabGlass is a SP Industries brand.